Sabarimala Ayyapa Online darshan tickets & Room Accomidation Booking was started for 2017-2018: Sabarimala Ayyappa Swamy temple is one of the famous and oldest Temple in Southern India and it will be open in some specific days throughout the year. Sabarimala Ayyappa Temple Dharshan had started from 23rd October 2017. Darshanam tickets for the year 2017-18 are available to book. Ayyapa devotes can book online darshanam tickets in online. 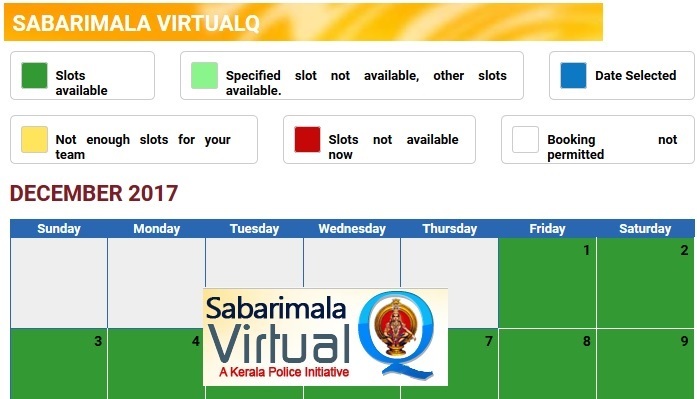 This darshanam online queue booking was actually offered by the Kerala police for the purpose of crowd management. For darshanam you are not required to pay any amount. These sabarimala online q darshan tickets are used to join the queue for darshanam and after verifying you credentials you are allowed for darshanam in the queue eventually who are waiting along with you in the queue. Then how to book sabarimala online darshan tickets 2017 - 2018? In this we provide you the information about how to book the sabarimala darshanam tickets through online. For dharshan tickets first of all register all the details in online and then you will get a User name and Password. Pilgrims who already registered can open the link with User name and Password and then book the tickets for dharshan. For new registration go through the below steps. Search for Dharshan slots booking available or not or the date which you want. Then enter how many devotees are planning to darshanam. Next a calendar will be displayed whether the slots available or not. If the color is green slots are available, if the color is red slots are not available. Then hit on the slot available date and select the slot of darshanam you want and then click on enter option. Next you will redirect to the confirm booking window in that you have to enter captcha and then click on confirm booking option. After you have to enter all the details of the persons for whom you are booking tickets. And then click on book the slot option, and then you get the darshanam tickets, take the print out of the tickets. You should have your recent photograph with a maximum file size of 30 kb while entering the details for darshanam tickets. Men above 18 years should carry valid ID proof. Photo ID cards will be allowed as valid proof like PAN card, aadhar card, driving license etc. One has to carry original ID cards while along with darshanam ticket coupon.